› Author AffiliationsThis work was supported by the Collaborative Innovation Center for Diagnosis and Treatment of Infectious Diseases, Tsinghua–Peking Centre for Life Sciences and by the 1000 Talents Recruitment Program. Owing to the ‘magic methyl effect’ on a compound’s physical and biological properties, methylation is a strategy frequently used by medicinal chemists in structure–activity relationship studies or in lead optimization. This article highlights the most recent reported methods for the direct methylation of (hetero)arenes, which mainly involve either C–H functionalization or cross-coupling of methylating reagents with (hetero)aryl halides. 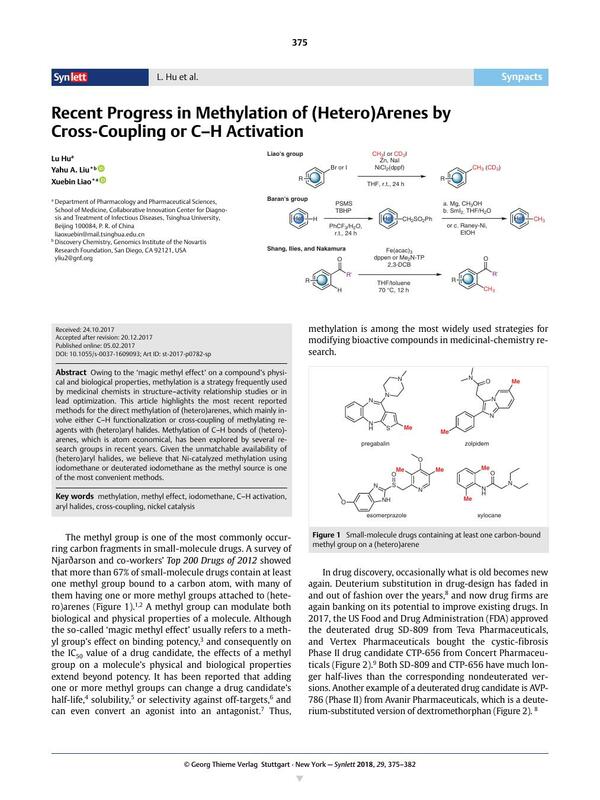 Methylation of C–H bonds of (hetero)-arenes, which is atom economical, has been explored by several research groups in recent years. Given the unmatchable availability of (hetero)aryl halides, we believe that Ni-catalyzed methylation using iodomethane or deuterated iodomethane as the methyl source is one of the most convenient methods. 2 Only the methyl groups connected to carbon are counted; therefore, ethyl is viewed as methylated methyl. Likewise, n-propyl, isopropyl, t-butyl, etc. are included. 15 Choi J. Fu GC. Science 2017; 356: eaaf7230 ; DOI: 10.1126/science.aaf7230. 25 US Environmental Protection Agency; Pesticide Fact Sheet: Iodomethane; https://www3.epa.gov/pesticides/chem_search/reg_actions/registration/fs_PC-000011_01-Jan-07.pdf.